Volkswagen of America, Inc. today announced the production version of the 2016 Beetle Dune, which will go on sale early next year. Inspired by classic Baja Bugs, the vehicle will enter the Beetle family as a new trim, offering a rugged addition to the rest of the model lineup. Overall, the Beetle Dune has a more aggressive appearance than the rest of the Beetle range, thanks to the fitment of new front and rear fascias and pronounced black wheelarch extensions that flow into the bumpers. Additionally, the Dune’s raised ride height of 0.4 inches and track that is 0.6 inches wider give it a more rugged stance. Highlighting the front end’s sporty look, the new front bumper features a large central air intake that widens towards its bottom edge, and a black honeycomb screen has an aluminum-look surround that morphs into the front skid plate. On either side of the intake, two black honeycomb vents contain the foglights. A Lighting Package will be available, which will add Bi-Xenon headlights with LED Daytime Running Lights and LED license plate lighting. The side of the vehicle is characterized by the contrast between the polished aluminum sills and the black trim strips that are reminiscent of the original Beetle running boards. Distinctive 18-inch Canyon aluminum-alloy wheels are fitted with 235/45 all-season tires. The side mirrors have contrasting black lower portions and Reflex Silver uppers, and “Dune” graphics are displayed on both doors. At the back, the Dune features a large rear spoiler, standard LED taillights, and a new bumper design that integrates matte black and aluminum elements, as at the front of the car. The rear diffuser also acts as a skid plate. The Dune is fitted with the Composition Color infotainment system that has a 6.3-inch screen with a capacitive touch sensor (similar to smartphone and tablet technology) that enables gesture controls like swiping and pinch-zooming. MIB II also features a proximity sensor, which detects when a hand is nearby and automatically switches its display to allow easier selection of specific features. USB and Bluetooth® connectivity for compatible devices are standard, along with a rearview camera and the Park Distance Control system. A Technology Package will also be available, which adds Climatronic® dual-zone automatic climate control, the award-winning Fender® Premium Audio System, KESSY® keyless access with push-button start, and a tilt-and-slide sunroof. 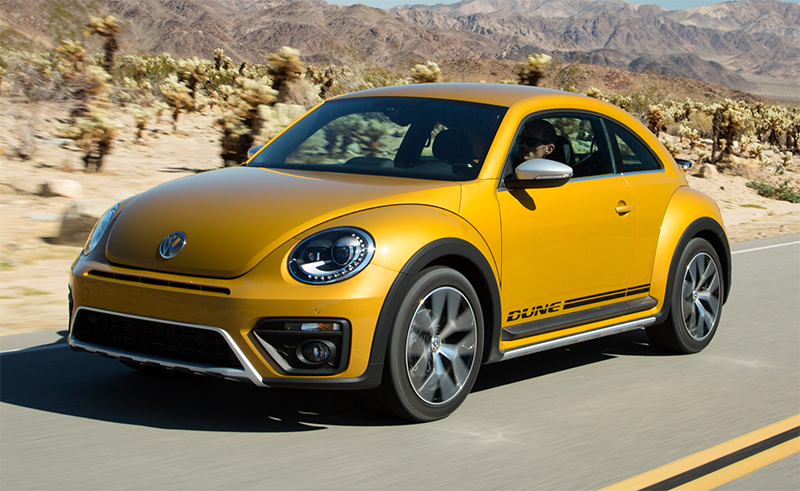 The 2016 Beetle Dune will be available in three exterior colors: Sandstorm Yellow, Pure White, or Deep Black Pearl. Sandstorm Yellow cars have an interior that features body color upper door trims and dashpads, whereas the Pure White and Deep Black Pearl vehicles have black door and dashpad trim. 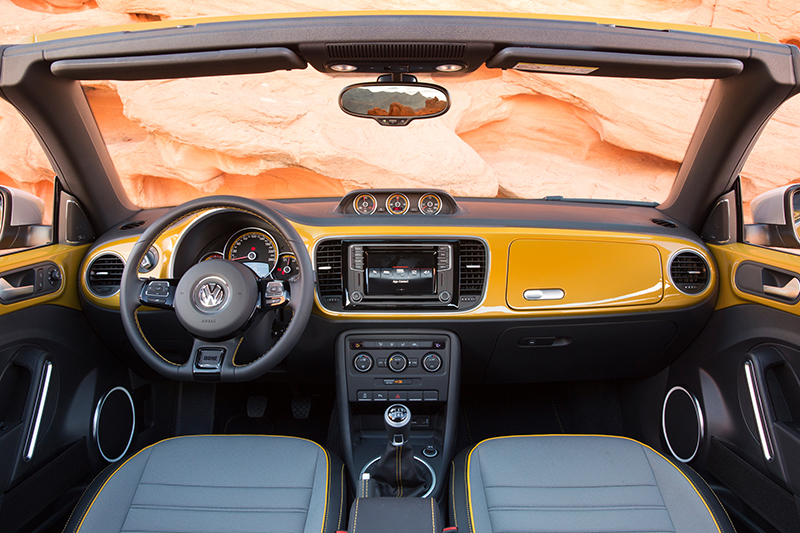 At launch, the Beetle Dune will be equipped with a 1.8-liter direct-injection and turbocharged TSI® four-cylinder engine, offering 170 horsepower and 184 pound-feet of torque, mated to a six-speed automatic transmission. The Dune coupe will go on sale in the first quarter of 2016, while the Dune Convertible will arrive in showrooms in the third quarter of the year.